Hello Swap-bot friends! 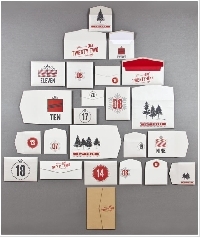 Christmas is right around the corner, and I thought an envelope Advent calendar swap would be a lot of fun! What you'll do is send one partner 24 numbered envelopes containing little goodies for them to open each day of December, leading up to Christmas Day. However if you choose to use a box, bag or something else that is ok. Envelopes are a way to make this swap easy and affordable for everyone. Send all numbered envelopes in one large envelope(senders choice in size.) Also NO PLAIN WHITE ENVELOPES. Envelopes should be decorated Christmas/ winter themed. Does not have to be elaborate. Example would be a reindeer on the front of envelope or using Christmas themed paper to make an envelope. Please don't forget to number them 1 - 24. Just make sure to mix it up. Don't send 12 days of washi and 12 days of scrap paper. This is a senders choice swap, but please take into consideration their dislikes and if any allergies. I will be checking all profiles before assigning partners. How exciting! I've already started gathering items. I found one item that is flat but a bit too bulky for an evenlope, is it acceptable to just wrap that one in pretty paper and make it look something like an envelope? Hi there sent you a pm regarding this swap.